As someone who spends a large chunk of her time— both at work and outside of it— researching restaurants, reading up on what’s new on the dining scene, and telling people what they should eat and where they should eat it, I really love it when someone else takes over and does the work for me. During last week’s pre-holidays trip to Miami, my sister took over the reins and suggested Los Verdes, a place in Broward county specializing in Colombian hot dogs and other fast food. So here’s what I learned: Colombian food, while delicious, gets very few points for being aesthetically pleasing. But I’m ok with that. Sometimes it’s ok for things to be a messy jumble. That’s life, no? Being the hot dog fan (examples 1, 2 and 3) that I am, it only seemed right to try one of the much-hyped (by my sister) Colombian hot dogs. When it came out, I wasn’t quite sure there was a hot dog involved because what was placed before us looked like a splayed out hot dog bun under a small mountain of crushed potato chips and sauce, a round, little quail egg plopped on top. The two sauces, a sweet pink sauce (probably a mayo-ketchup combo) and the sweet pineapple sauce, were no ketchup and mustard but they were good and put a whole new spin on the dog. Biting into this monster, stuff went every and got smeared on everything, but all of it was good. 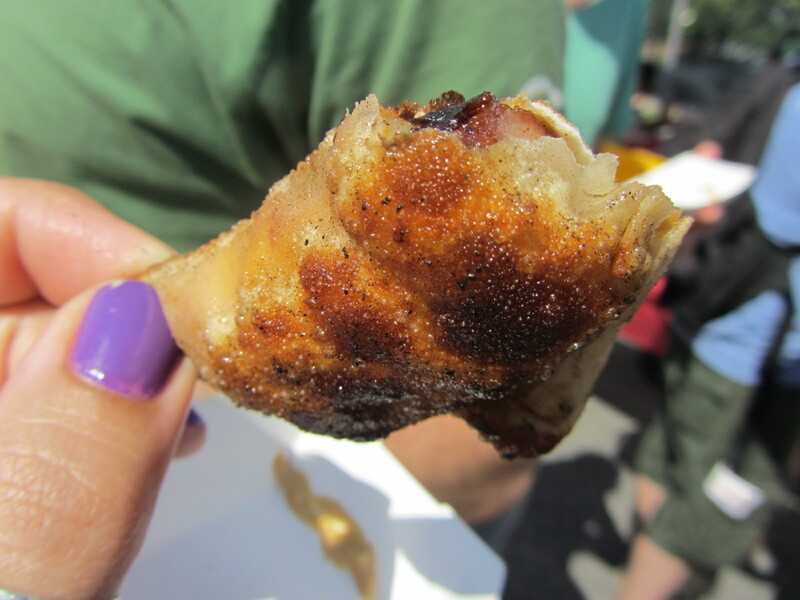 The different textures were fun and the different flavors were interesting when eaten with the buried hot dog. Sure, I probably should’ve worn a poncho to eat this thing, but I enjoyed it all the same. All this mess and I hadn’t even touched it yet. Next on the tour of wildly messy but tasty Colombian foods was the chicken burger, which was more of a chicken sandwich than a burger (breast not patty) and included more of the same ingredients from the hot dog. The towering “burger” seemed to spill out from underneath its bun, sauces oozing, melted cheese dripping down, lettuce, tomato and bacon jutting out from everywhere, on top of the seeming explosion of crushed potato chips. Again, not exactly date food (at least not first date, if you ask me) but since I was there with family, I might as well have been invisible for all I cared. Last and probably my favorite of the three, was a Colombian maicito with chicken, basically a bed of loose corn kernels topped with— yup, more of the same— mozzarella, sauces (pink and pineapple), chopped chicken, and the by now ubiquitous crushed potato chips. Ok, so Los Verdes is kind of repetitive with their toppings, but there’s good reason for it: mixed all together into a sloppy, mushy mess, they’re delicious! This plate, with the sweetness of the loose corn, was oh so tasty. Points to my sister for an interesting, ridiculously filling, messy but delicious recommendation, even if she did leave out the fact that I would need protective gear to eat it. 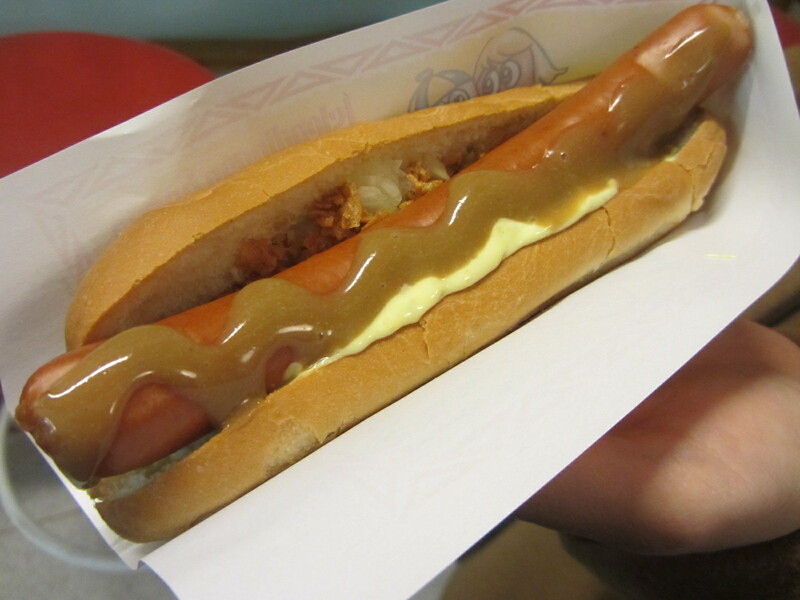 Hot dogs are so tasty that these Icelandic ones are eating their own kind! I know they’re made out of weird animal odds and ends, and really, as an adult who occasionally is concerned with what she puts in her body, I should mistrust and dislike hot dogs… buuuuuuut, I just can’t. I friggin’ love ’em. I really do. I love hot dogs. In Iceland, like New York City and Chicago (both whose dogs I’ve eaten), they’re pretty proud of their weiners. And rightfully so, because even though I only ate one icelandic hot dog during my trip, it was a great one. 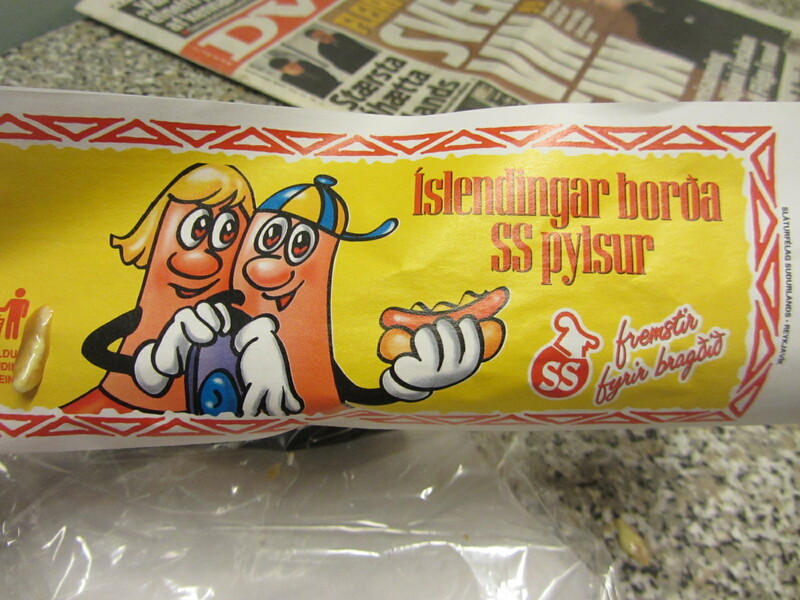 SS Pylsan is the Oscar Meyer of Iceland and based on their ubiquitous SS logo, they seem to have a monopoly on the hot dog scene. Unlike regular ol’ American dogs, theirs have lamb meat added into the mystery meat mix, which is probably why they’re extra tasty. I like to eat my hot dogs however the locals do so I ordered mine with everything, which meant one long, skinny hot dog dressed up with a sweet remoulade, mustard-mayo mix and my favorite part, crunchy fried onions. Cheap (definitely the cheapest thing I ate in Iceland), easy and delicious, if you forget about the hodge podge of animal parts that go into making a hot dog, what’s not to love about them? They’re great… all over the world! Saturday had everything I ask of summer in the city: tolerable warm weather, cold beer and lots and lots of hot dogs. Bam! Just like that, recipe for a good time. This was probably my favorite of the many I had. 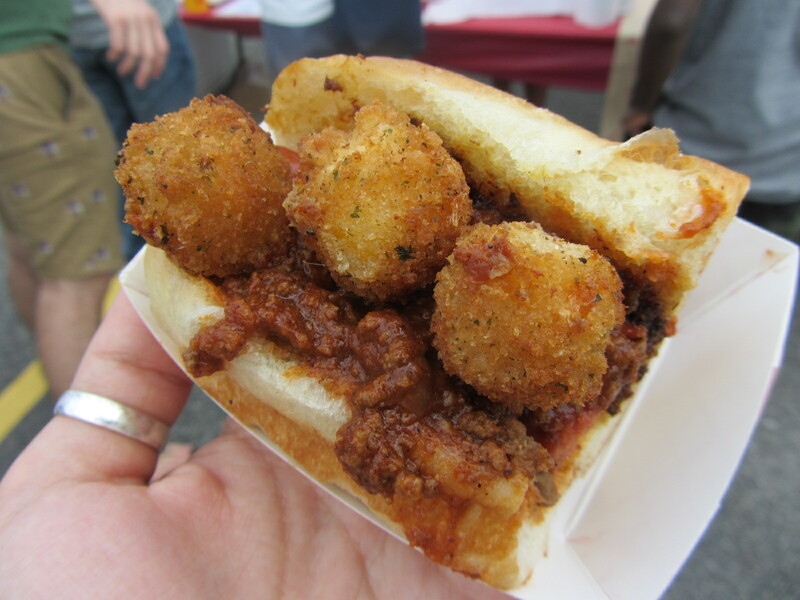 A chili cheese dog of sorts, the “Nick Mangold Over The Line Dog” was a deep-fried (yea, I know) hot dog with spicy, sweet chili and here it comes… mini fried cheese balls that kind of resembled tater tots. A heart attack waiting to happen, but SO good. Re-imagining the traditional hot dog presentation, “Little Bundles of Joy” were like small hot dog empanadas, fried pockets of hot dog, mac and cheese, kimchi and chinese sausage. Double points for tastiness and new form. 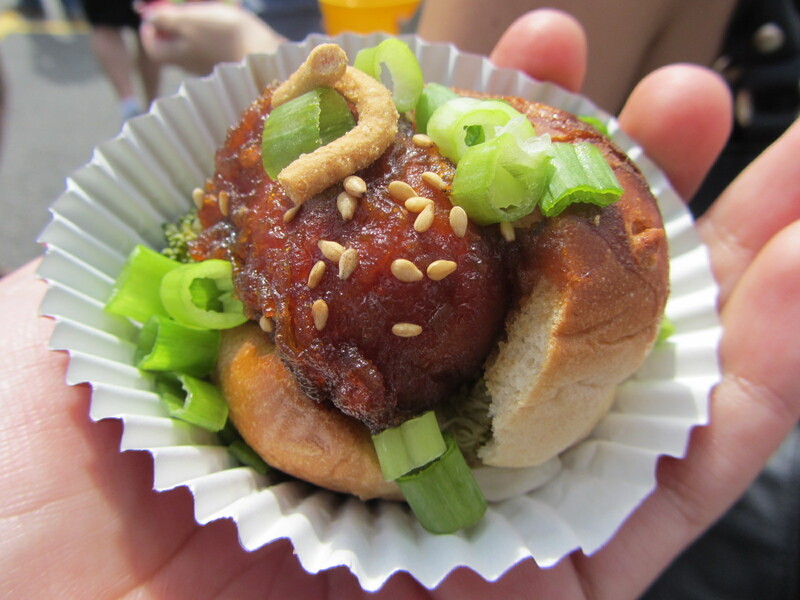 Another tasty dog with interesting presentation was “General Tso’s Hot Dog,” a play on the Chinese restaurant staple, General Tso’s chicken. Battered and deep fried, this little dog was smothered in sweet and spicy sauce and topped with broccoli, sprouts and crunchy chow mein. 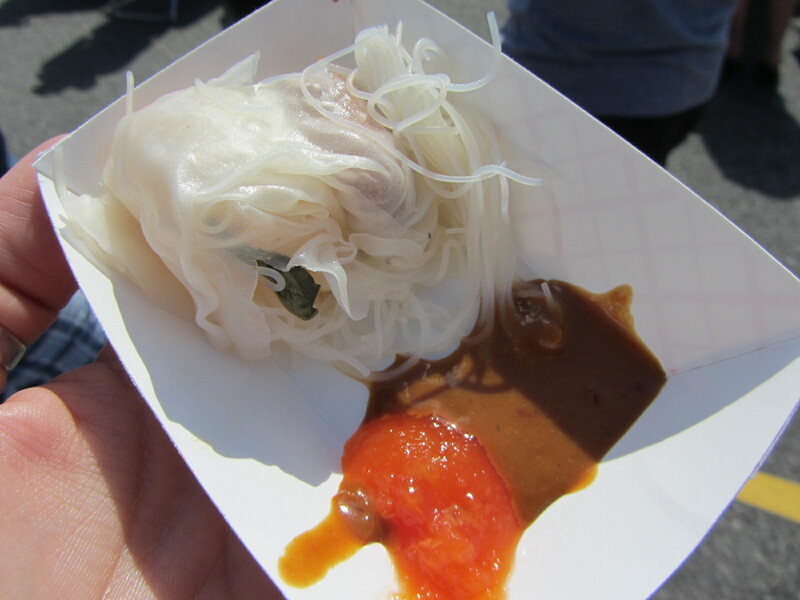 Also putting an asian spin on things was the “Pa-Pa-Ya Summer Roll Hot Dog,” which instead of a traditional bun came wrapped in Vietnamese style rice paper and took flavor cues from spring rolls and shrimp and papaya salads. It was light and clean, with zesty, spicy flavors. 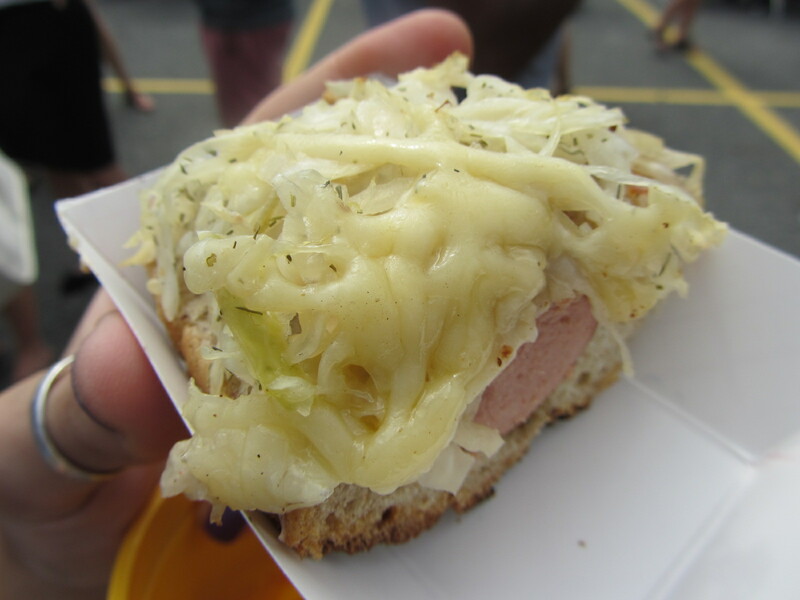 “The Reuben Dog” instead, took its inspiration from the Reuben sandwich, with almost all of the same ingredients that make the sandwich a classic: sauerkraut, corned beef, Russian dressing, gooey swiss cheese, and a rye bun. As a Reuben fan, I gave this dog two greasy thumbs up. Finally, when I was at the point of undoing the top button of my shorts while also breaking out into the hot dog sweats, I made room for one more, “The Hot Dogiflette.” Based on the french dish, tartiflette, this dog was served on a toasted baguette and topped with mashed potatos, sauteed onions, herbs, melted cheese and sour cream. Kind of hard to eat and required a bit of a wait (probably because of all the ingredients that were painstakingly layered on there) but sacrebleu it was good! While there were some I ate and just didn’t post here, there were still a whole bunch I didn’t try! That means, Hot Dog Cookoff, I’ll see you again in 2013! 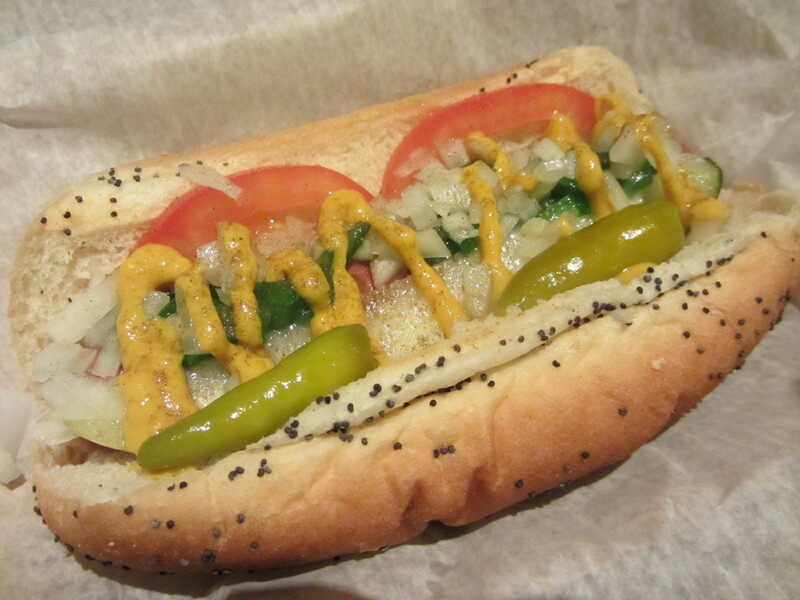 Is there a more quintessential summer food than hot dogs? Lobster rolls, you say? Well what about hot dog-lobster rolls? As in a hybrid of the two. Too much summer in one food? Nonsense! Now, as some of you might know, I actually hate summer. And this particular summer, though not as hellishly hot as summers past, has gotten no more love from me than before. (Partly due to the fact that my boyfriend will be gone for almost all of it, leaving me to count the days till fall.) But I don’t want to be a total hater, so I’m trying to seek out the good in the current season. 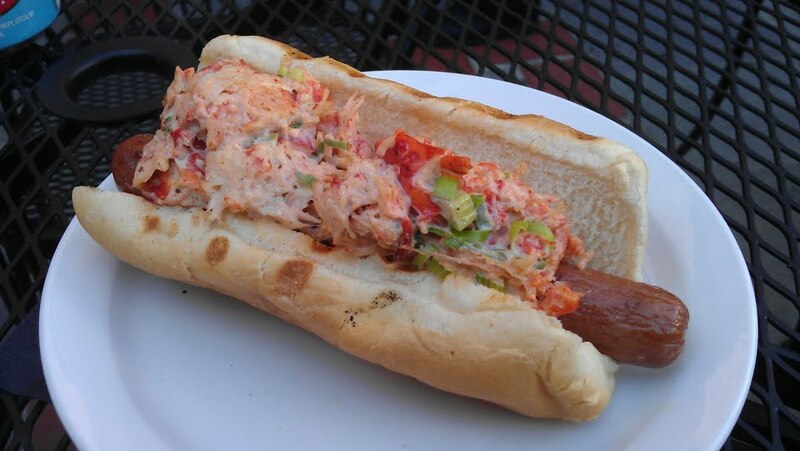 Enter the hot dog- lobster roll. I read about it online recently, and yesterday during my day off, when I found myself near the place that makes them, I went and got one. Henry’s Rooftop Bar at midtown’s Roger Smith Hotel isn’t really anything to write home about so I’ll skip straight to the food, which unfortunately didn’t blow me away either. The lobster topping on the hot dog just wasn’t fantastic, it was only ok, and probably needed to be a little creamier and smooth. But overall it wasn’t bad and I still really like the idea of it so hopefully someone out there in the city will tweak it and make it better. In the meantime, I’ll be riding out the rest of summer, waiting for fall. I may not be a huge fan of this city’s pizza (see “Best pizza on this side of the pond”) but if there’s one quintessential New York food that I’m completely for it’s the hot dog. I love it with sauerkraut and mustard, with just ketchup, with chilli and onions, from street vendors and from sketchy holes in the wall, kosher or not, in summer and winter. But as much as I enjoy a good dog, Flaneur loves them even more. 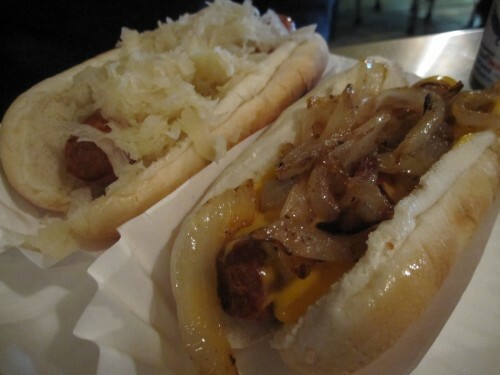 So Friday night we set out for the East Village (once again) with our friend Vanessa to try the wieners at Crif Dogs, which I had heard were among the best in the city. First sign a place is good: it’s packed. 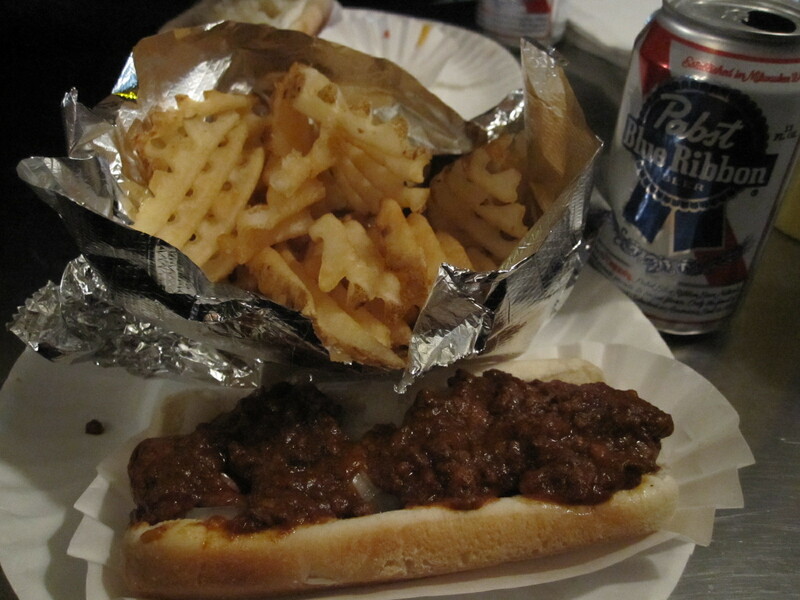 And Crif Dogs, when we walked in around 8, was just that, with people crammed around tables cluttered with PBRs and paper plates of hotdogs, fries, and—is that what I think it is? — tater tots. Feeling good about our soon-to-be dinner we walked up to the menu, which read like a stoner’s fantasyland of crazy combinations, ridiculously high calorie counts and toppings on top of toppings on top of toppings. 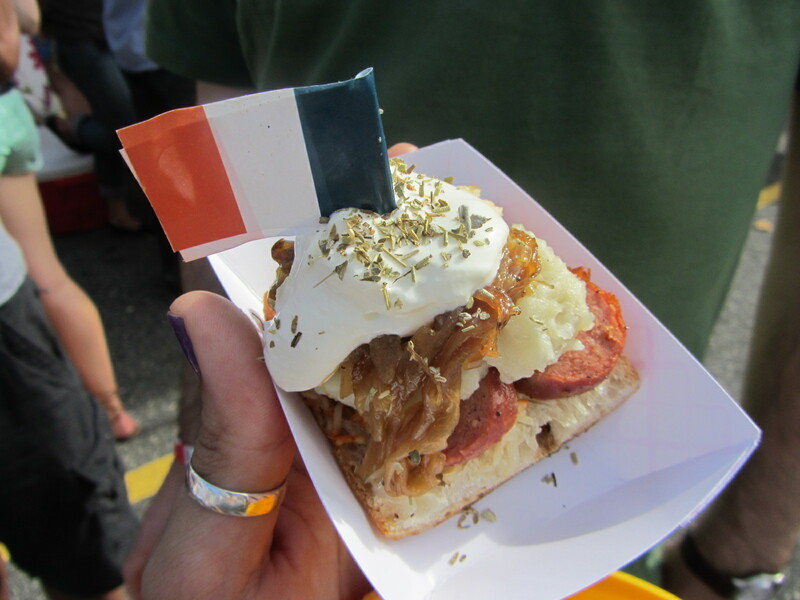 There was the “Jon-Jon Deragon,” a Crif dog (handmade, naturally smoked beef and pork) with a schmear of cream cheese, scallions and everything bagel seeds. Or the “Good Morning,” a bacon-wrapped dog smothered with melted cheese and a fried egg. Or the interestingly named “Spicy Redneck,” a house dog, bacon-wrapped, with chilli, cole slaw and jalapeños. Yikes, this really is a stoner’s heaven, I thought to myself while trying to decide if a fried egg on top of a hot dog would propel the calorie count into the four or five digit count. In the end, both Vanessa and I opted for a more classic hotdog, which compared to the other ones almost seemed tame, the good ol’ chilli dog: smothered in mustard, onions and secret chilli sauce. We both also added a side of waffle fries for good measure. Lucky for us, a few people cleared out and the three of us squeezed into a table to wait for our dogs. Minutes later the Tubesteak and company arrived. Only thing better than a good wiener is good chilli to smother it with. The first thing I noticed was the waffle fries which were a good firmness, not too soggy or too crispy, but just right. And they weren’t too salty either, which I appreciate in a fry. It’s always worrisome when a fry leaves actual grains of salt on your fingertips. Makes you wonder what its doing to your insides, mainly your arteries. After a few fries, I went for the dog before it could get cold. The bun was soft, which I like. (I’m not a fan of the extra toasted bun, which is how my mom’s hot dog buns always came.) The chilli was a nice deep brown color and not that weird orangey, red chilli color that screams artificial when you bite into it. It packed a good amount of taste made just that much better by the chopped onions underneath. The mustard added the extra spicey zing I like in almost everything that’s not a dessert. I had a couple bites of Flaneur’s hot dogs and those were pretty good too. Flaneur, who’s eaten his fare share of hot dogs all over Manhattan in the few months he’s been here, seemed to thoroughly enjoy them as he as he wolfed both down in a few gigantic mouthfuls. The Philly Tubesteak in particular seemed like ideal munchies food. I mean really, a hotdog with cheese whiz? That has stoner written all over it. And that’s ok with me. Crif Dogs won me over just with its tasty, over-the-top franks but to make it even better, it’s also home to a speakeasy style bar, Please Don’t Tell, accessible through an in-house phone booth. We didn’t make it in because apparently it’s not much of a secret and people were lining up just to be given wait times of up to an hour. So now, you see, I have to go back. And if I’m going, I might as well get another Crif dog or two to hold me over while I wait. Maybe even with a fried egg.